Which Android tablets offer the best battery life? I compared all the devices I reviewed in the last year. Here are the five winners. The battery life is one of the most important features in an Android tablet. Usually, we use them in bed, while watching movies on the sofa or while traveling by train or plane. And we don’t want to have a charging cable running out of them. I always do the same battery test for all of my tablet reviews to get comparable results. 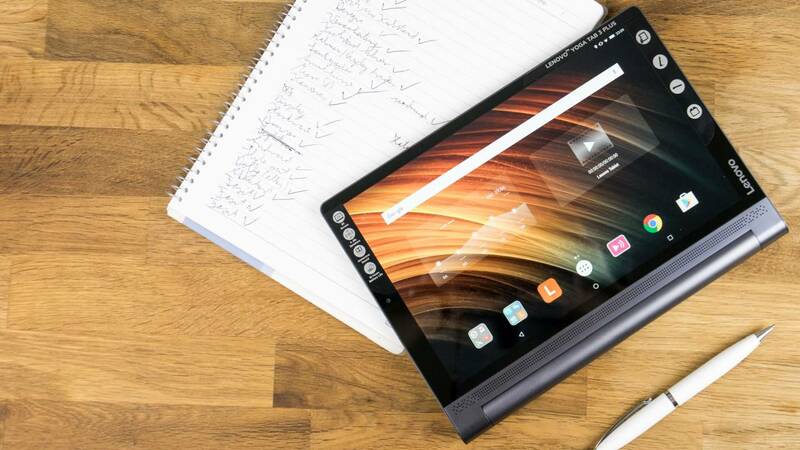 Here are five Android tablets that got the longest battery life according to my reviews. I only included devices in this list that have been released in the last year. Nobody wants to buy an old Android tablet even if the battery life might be excellent. I’ll update this list once further tablets are released and tested by me. According to my reviews, the Lenovo Yoga Tab 3 Plus has the best battery life of all current Android tablets. In my test, it got a runtime of about 16 hours. That’s awesome and to be expected because Lenovo is giving us a huge battery with a capacity of 9300mAh. The Yoga Tab 3 Plus has an interesting design because the battery is included in a kind of handle that also has an integrated kickstand. Other features of this tablet are quite impressive as well. Inside runs a pretty powerful Qualcomm Snapdragon 652 SoC with 3GB of memory. In my benchmark comparison, it’s a bit weaker than the Huawei MediaPad M3 and Samsung Galaxy Tab S3. After I finished my review of the Yoga Tab 3 Plus I couldn’t recommend it in the fall of 2016. There has been a software bug with the audio but luckily that has been fixed now. Even though the Amazon Fire HD 8 is a very inexpensive tablet, it got surprisingly good results in my battery test. In fact, it has a runtime of around 15 hours which is very impressive. Obviously, we’re not getting the best internal hardware here. The 8-inch display only has an HD resolution but the QuadCore Chip is powerful enough for its price. We’re getting 1.5GB of RAM and Amazons Fire OS. Since the integration into Amazons services like Amazon Video and the Kindle e-books is very heavy I would mainly recommend the Fire HD 8 for Prime members. The Samsung Galaxy Tab S3 is the best Android tablet right now. It’s quite expensive but comes with a nice Super AMOLED display and powerful hardware. Considering the performance the battery life is excellent at 12.5 hours. With the Galaxy Tab S3, we’re getting a high-resolution 9.7-inch display, a Qualcomm Snapdragon 820 and 4GB of RAM. It’s the only tablet on this list that is directly shipped with Android 7.0 Nougat. It’s the most expensive tablet on this list as well. But if you want and can afford the best in all categories, this is the one to get. While the ASUS ZenPad 3 8.0 is not a very famous tablet it is surprisingly good for its price. Especially since LTE 4G is included. The battery life is very good with a result of around 11 hours in my test. The ASUS ZenPad 3 8.0 has an 8-inch display with a Snapdragon 650 and 2GB of RAM. It’s quite the performance for the price but has a full plastic body. That’s kind of the only downside here and you might want to consider to spend a bit more for the Huawei MediaPad M3. Even though the Samsung Galaxy Tab A 10.1 is about a year old now I still think it’s the best value for your money. It depends on where you get it but for around 200$ we’re getting a solid battery life at 10 hours and 45 minutes. It comes with a nice 10.1-inch full HD display, an Exynos 7870 OctaCore chip and 2GB of RAM. The build quality is pretty good. One downside is that the stereo speakers are positioned on one side only but for a 10-inch full HD tablet that’s still acceptable. There are a couple of other Android tablets that offer a very good battery life but didn’t make it on my top 5 list. The most interesting ones are the Huawei MediaPad M3 and ASUS ZenPad 3S 10. Both offer a very similar battery life to the Galaxy Tab A 10.1 at over 10 hours but are more expensive. If you want to spend a bit more you get a very nice build quality with both competitors. They offer a full aluminum body, very nice displays, and a very good performance. In all of my reviews, I always do the same battery test. I’m running an HD video over and over again until the tablets shut themselves off. Brightness is always set at 50 percent, audio is deactivated and WiFi is always turned on. I deinstall apps like Facebook that search the web for updates constantly but there are notifications coming in from Gmail occasionally. With this battery test, I get relatively good comparable results. But it’s not perfect. A lot of other factors play a role when it comes to battery life including the brightness of the different displays and also customized user interfaces by the manufacturers. Sometimes their preinstalled apps and features are not very battery friendly and you might get better results by deactivating them or even using different launchers.